Some great games to report on this week with our Firsts, Seconds, U14’s, U10’s and U9’s all in action. In the senior games there were 3 fifties scored with some great individual performances on the batting and bowling fronts. It’s not every week that a dad has an opportunity to play in the same team one of his lads. 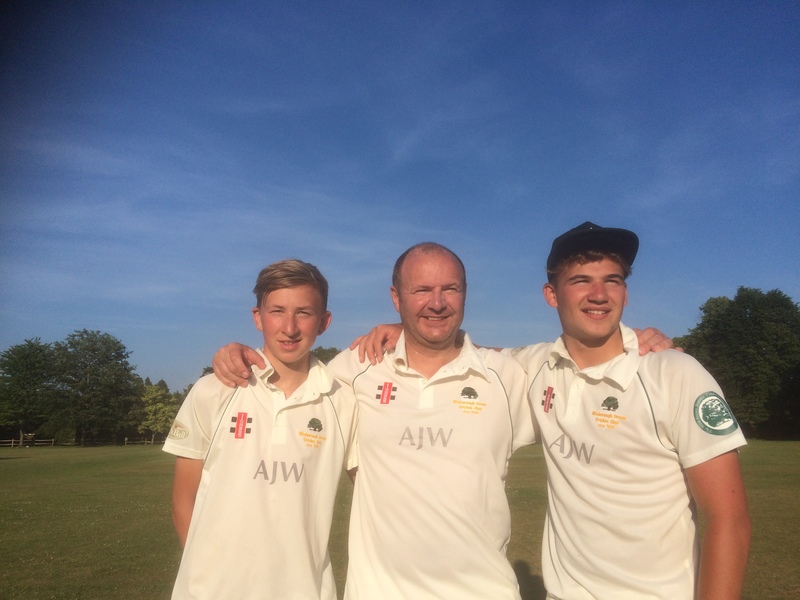 A somewhat special day for #TeamColbran on Saturday with dad Andy playing alongside sons Tom pictured left and Joel pictured right below – one for the family photo album for sure. Inspirational performances from the whole family on the day to secure a great victory for the seconds. Chris is currently 66.67% of the way through the challenge, in which time he has clocked up 132 miles at an average of 13,000 steps a day. Not bad for a desk-jockey who sits in front of an Excel spreadsheet most of the day. As we indicated in previous editions of Wizzy News all the stats for all the games are collated on the Playcricket website by the England Cricket Board. As we are approx 1/3 of the way through the season we thought we would publish the batting and bowling stats for the first and second team players for the season to date. There are certainly some very impressive personal performances on the lists. What the stats do not however show is the very positive spirit in both the first and second teams at the moment and the determination to improve. Long may it continue lads – great to see. Click here to see the seniors’ individual performance stats to date. 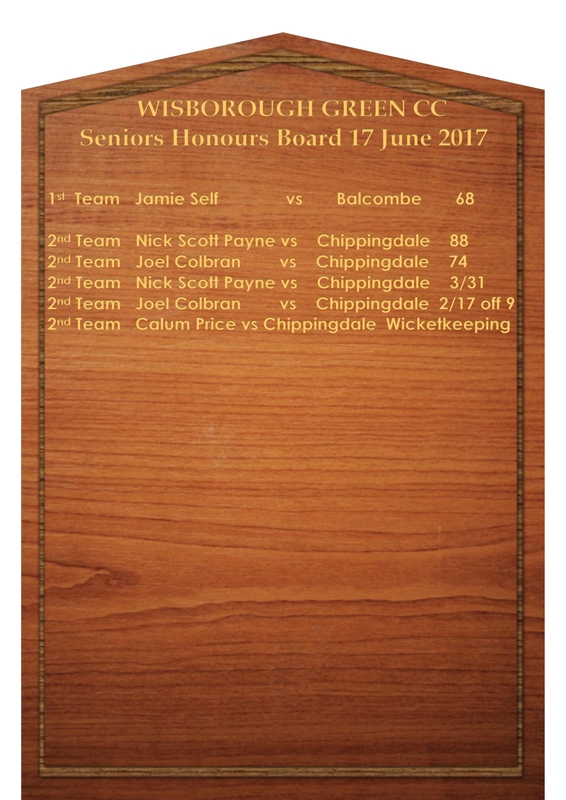 Click here to see who has been selected to play for the Firsts against Brighton and Hove at home on Saturday (there is no second team game). It would be great to have some home support cheering the lads along. Victory over Steyning with dominant fielding performance. A good game of cricket played in the right spirit by both teams. On a very hot day in Balcombe we were surprised by the ground and wicket. Wicket seemed to be drying by the minute and the ground was like an upside down saucer. We lost the toss and they unsurprisingly elected to bat. Balcombe opened with the dangerous Stillwell and was soon smashing it to all parts. Wisborough struggling to contain him and the first 7 overs went for 50. Stillwell went on to score at will, until we allowed him to have a single and decided to bowl at the other batsman. This plan worked well and frustrated Stillwell until he had a slog at a Ben Thatcher straight ball and was bowled for 77. Wisborough were then in the game until 2 overs of 16 and 18 got Balcombe back on track scoring an unlikely 245. On a tiny, uneven and drying pitch the score was well within Wisborough’s grasp. Dodd and Sadler started well with 40 coming up in no time. Dodd was then unluckily caught by a ‘miracle catch’. Steyn then came to the crease and after smashing some 4’s was also well caught in the gully. Napper came and went 1st ball, and the rejuvenated Self, whose bat no longer resembles a wand from Harry Potter, hit the bad ball and defended well. Sadler then departed with a flick down the leg side going to hand. Wisborough batting collapsed at 51 for 1 and 77 for 8. Self and Rainford batted well and made the game respectable but the damage was done by some mediocre bowling that knew how to bowl on a very ordinary wicket. Wisborough finishing on 157 all out. A couple of losses in the last 2 weeks has changed the season so far. However the team are practicing hard and doing everything to play better cricket. If players are working hard and doing what they can in the nets and on the pitch then good results will come. 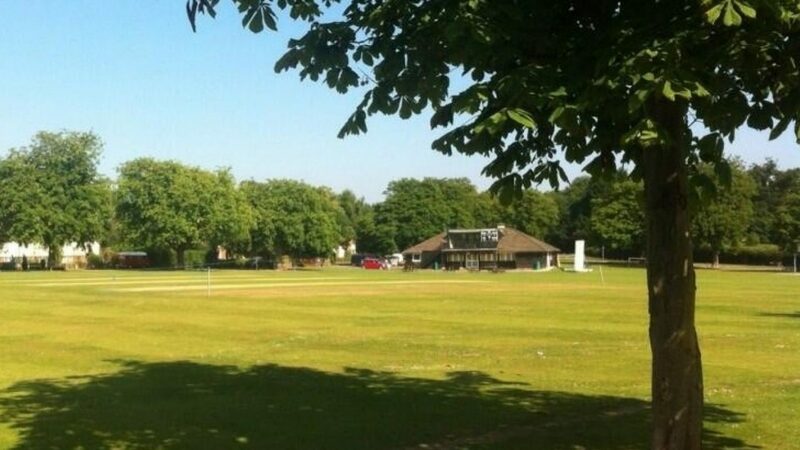 It may not be this season that Wisborough bounce back up the leagues, but I have been approached by so many people saying ‘there is a real buzz around the cricket and people are enjoying it again’. So to me that is the best feedback we in the cricket section can have. Success on the pitch will come. A game of ebb and flow sees Wizzy 2s come out on top against the Chippendales. School fair day is a curious thing because it meant that the seconds XI home game had to be played away at Storrington. SCS had a long chat with the host for the following day, a stalwart of the club who was in his 50th year of playing. The wicket was used from the previous week end but it had been rolled and cut. However, on inspection it looked an odd sort of track, with the grass a bit tufty and the top not necessarily concrete. With a strong bowling attack, and very hot weather the skipper was uncertain what to do if the toss was won. Luckily the opposition skipper called right and decided to field. It might have been the right call or it might be a long hot afternoon for the Chips. The battle commenced, Tommy Colbran being given the opportunity to open the batting and it soon became apparent that this wicket would be a little difficult to bat on, balls stopped, balls jumped and balls staid low. Concentration was going to be required for batting and a little luck. The start was a little turgid with both opening bowlers for Chippendale bowling good lines and the score ball ticked very lazily over. Tommy was done by a ball that both stopped and stayed low and this brought Mariner to the crease in an elevated and highly responsible position of 3. Soon after the skipper went, to a diving one handed catch, and at 14 for 2 Chips were very much on the up and the fielding looked sharp. This brought Joel to the wicket. Joel survived an early scare being dropped but then built an innings of power and stout defence. Pulling anything short and hard proved to be a good tactic. Mariner was on a mission and the mission was to concentrate – boy did he! Slowly the pair took the total to 35 at 10 overs and then to 80 at 20 overs. They were still there at 30 overs and both had passed their 50s, not without a few scares on the way, but somehow the sharp Chips fielding started to collapse with the powerful hitting of the pair. They accelerated and accumulated runs and batting points as the day got hotter and hotter. After the pair posted their 150 partnership, Joel eventually fell finally caught for 74 although by the sound of his bat he might need a new one for the next game. What a partnership – a real game changer! Mariner was in no mood to surrender, and despite the loss of George Andrews, he carried on until the 39th over for a fantastic innings of 88, before being dismissed caught behind. A couple of lusty blows from the 2 JPs meant that Wizzy closed on what at one time seemed an improbable 198. This was 20 or so runs beyond the wildest expectations of the captain. With a new opening pair of James Powell and Joel Colbran on a lively pitch the skipper felt sure that an early breakthrough was going to be imminent. However JP2, needed a few overs to find his range after a break from cricket, and despite the nagging accuracy of Joel the openers got off to a good start – racing to 30 in the first 6 overs, and pulling anything short. The skipper brought on JP1 who bowled with accuracy but the breakthrough did not arrive. Meanwhile Luca was brought on form the other end was perhaps the unluckiest bowler of the day beating the bat, getting edges and slowing the score rate. This put a little pressure on the batsmen but at 74 for no wicket off 20 overs needing 6 an over for the next 20 and with all wickets in hand Chips were in the driving seat. The captain called to Josh Dixon, and this is when the game changed. He separated the opening pair when the Aussie opener tried a reverse sweep to release the pressure that was building. The bowling was switched again and Tommy Colbran who was bang on length and line deceived the dangerous Tolchard and bowled him for 60. Was the game about to turn? (107 for 2). It was time to bring on the batting hero and Mariner hit length and line straight away. A false shot, a catch down mid-on’s throat – we were back on top – no a drop! However almost the very next over a carbon copy dismissal followed this time with trembling knees JP stood firm and the game was well and truly on. Chips needed to attack, but a great running catch in the deep by Joel of Nick meant they were losing wickets and Wizzy were definitely in the game. Chips were 126 for 4, two new batsmen at the crease and time running out with 10 an over required. Joel replaced Tommy and bowled full and straight, 2 wickets in 2 balls and almost a hat trick (if JP’s fingers were three centimetres longer as he dived forward for a catch), swung the game further Wizzy’s way. Another wicket for Nick sealed things. Chips were well behind the score rate now and the game had totally changed. We played out the final 3 overs with the victory in the bag. A fantastic performance by the team and maximum points to take us to the heady heights of third in the table. Both Mariner and Joel had had fantastic games. But on this occasion, however there were a few more heroes that needed to be mentioned. Peter Klein for scoring all day impeccably, Dave C for umpiring at both ends and Lena and Lesley and Trevor Price. The former for providing yet another sumptuous tea 10 miles from her usual venue, and the latter for bringing her to the ground thereby making sure we all ate well and JP could play. Last but not least it was a good day for the Colbran family, Dad playing with his two sons. Thanks Andy and what a day, Tommy taking a critical wicket and Joel batting and bowling beautifully, your fielding was energetic too!! On a very hot Sunday afternoon, the Wisborough Green Under 9’s took on Slinfold CC at Collard’s field. Slinfold won the toss and elected to bat first. The Wisborough Green Colts bowled very well with great line and length bowling. The fielding was also very sharp and Wisborough Green restricted Slinfold to a total of 276 off their 16 overs. Well done to Finn Versteeg whose spell saw two wickets fall. Overall a great team performance with the ball. Wisborough Green then began the run chase very well. Great batting from Finn Versteeg and Joseph Reed saw Wisborough Green put on an opening partnership of 34 runs. Our captain for his first match for Wisborough Green, Charlie Long and Rufus Foden followed and scored an excellent 28 runs. William Green and Oliver Marshall then saw the Wisborough Green Colts past the Slinfold total with a partnership of 32 and both players batted very well. The final pair Dexter McCullen and William Reed also batted very well and put on a total of 42 to seal the match. Congratulations to William Reed who top scored with 28 runs. A great performance from all the Colts with the bat and some excellent running between the wickets! The final scores were: Wisborough Green CC 336 off 16 overs and Slinfold CC 276 off 16 overs. 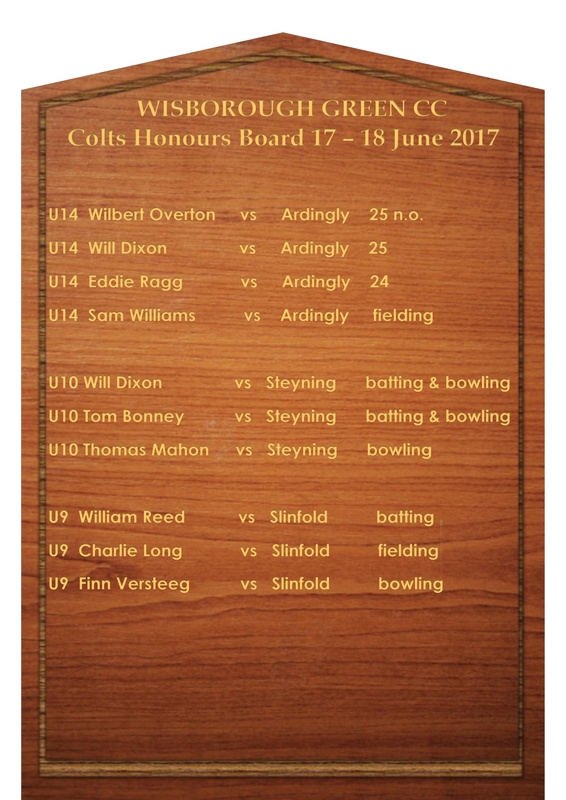 Congratulations to all the Wisborough Green players – a great team performance!